At Westlake Hills Dentistry we want you to have the smile you deserve. We use the most up-to-date dental procedures and technology to help you achieve this goal. Onlays and inlays are dental restoration use as an alternative to full crowns; when the cavity is too big for a normal filling and too small for a crown. They are also known as indirect fillings and offer a stronger, longer lasting, and well-fitting solution to tooth decay or damage than a normal filling. Onlays and inlays offer superior esthetic and functional benefits to our patients. Traditional fillings are molded and placed into your mouth where inlays and onlays are fabricated by Dr. Ho and then fitted and bonded onto your tooth. An inlay is bonded onto the center of your tooth, while an onlay includes one or more cusps (points) of your tooth or covers the entire biting surface. Using CEREC® technology Dr. Ho can fabricate onlays and inlays to match the color and shape of tooth so that the onlay or inlay looks and feels completely natural. There are many benefits of onlays and inlays over traditional fillings. Since onlays and inlays require a conservative preparation process more of the healthy tooth is preserved. Dr. Ho will be able to fit your new onlay or inlay to fit perfectly and help to preserve the tooth and restore it. With CEREC® technology we are able to mill your onlay or inlay right in our office and match the color and shape of your natural teeth perfectly. Your new onlay or inlay will not stain and discolor like traditional resin fillings. Onlays and inlays won’t shrink over time like traditional fillings and protect your teeth from further damage from bacteria with superior fit. Each onlay or overlay is tailored to fit your tooth perfectly giving you smooth seamless edges which are easy to clean and comfortable. Onlays and inlays are stable restorative solutions and can help to restore and strengthen damaged teeth. Because minimal preparation is needed more of the natural tooth is preserved and then strengthened. At your first visit Dr. Ho will examine your tooth and take digital images of the tooth and surrounding area. He will talk to you about the shape and color of your new onlay or inlay. Next he will prepare your tooth. 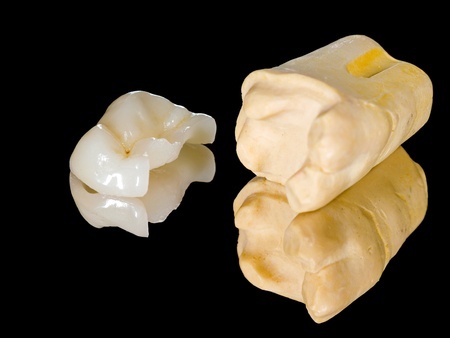 Using CEREC® technology Dr. Ho can mill an onlay or inlay to match your tooth perfectly in clarity, shape, and color. Once the permanent onlay or inlay is ready the doctor will place it on your tooth, bond it, and smooth any edges. You will then have a beautiful natural looking onlay or inlay which will protect your tooth and restore your smile. We can do this procedure in one visit. For more information about onlays or inlays contact Westlake Hills Dentistry today. Our offices are equipped to provide an array of restorative procedures such as porcelain veneers, dental implants, composite bonding, and tooth-colored fillings.